Based in Croydon, South London Electricians are an experience installation and maintenance company that can provide expert advice and service to anyone living in Banstead and the surrounding areas. Whether your job is big or small, whether you are calling for help in the home or as a representative for a larger company, we are more than happy to help. We take on projects of all sizes, and can provide a personal, one to one service with a high level of commitment that you won’t find anywhere else. Adrian and the team are all fully qualified electricians with years of experience providing establishments across the country with excellent services whatever they require. From electrical testing and lighting fixtures to setting up home entertainment systems and installing CCTV for small and large businesses. Whatever services you require, South London Electricians are willing to go the extra mile to ensure complete customer satisfaction. With over 20 years experience providing electrical maintenance and installation in London and the surrounding areas, since its establishment in the 1990’s, South London Electricians has serviced over 3000 homes, and we have worked with retail giants such as All Saints and Tesco. Plus we were some of the first contractors to fit electronics in New York lofts, and have completed various other jobs overseas. South London Electricians is registered with NICEIC and listed on government approved websites such as TrustMark and Checkatrade. We are also enrolled on the Competent Person Scheme, showing a directory of trusted and qualified traders for all your domestic and business needs, so you know that we have the quality experience and knowledge to provide you with first class electrical service. Plus all of the work that we carry out is designed to meet the latest wiring and electrical regulations, and we will ensure that any maintenance or installation we carry out meets the health and safety requirements on your premises. We have a huge range of services to offer, including general maintenance, replacements and electrical testing and we offer a no obligation survey and quote service, if you are unsure or are thinking of installing something in the future. Contact us by phone on 07956 523316 for more information, or view our full list of services by having a look at the links to your left. 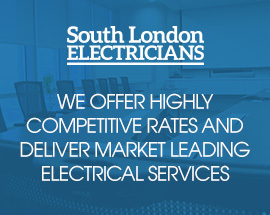 We are confident that South London Electricians can provide you the most competitive service for the Banstead area. South London Electricians offer a full range of domestic electrical installation services within London and the Home Counties. No matter if just need a few extra sockets or a complete rewiring, we’ll complete the work to the highest possible standard. © 2019 South London Electricians. All Rights Reserved.